Get your Indie Untangled yarn ball logo bags! I’m pretty excited to introduce you to the newest Indie Untangled vendor, which is none other than… Indie Untangled! 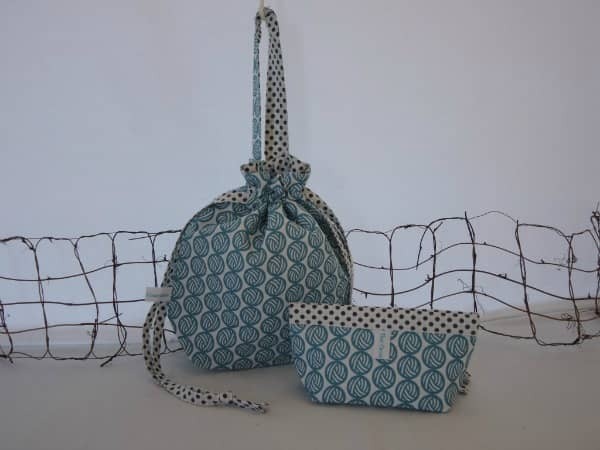 If you were around when this site launched in April, then you might have participated in the first giveaway of the special bags that Vicki of That Clever Clementine sewed up with Indie Untangled yarn ball logo fabric. Since the response was so great, we decided to collaborate and sell the bags through the site. We’re starting off small, and Vicki has enough fabric on hand for an initial batch of six 10 “Belle” project bags (this custom bag differs slightly from the one in the above photo in that it has a single white twill drawstring with toggle to close it up) and about a dozen “Snapdragon” notions pouches. You can order up to one of each bag through the order form. If there’s demand beyond the initial run, we do plan to produce more, so don’t despair if you miss out in this round. Just keep your eyes on the marketplace and subscribe to the weekly newsletter. This entry was posted in Indie Untangled and tagged bags, pre-orders.